INTERCHANGEABLE BLADES- Comes with 7 interchangeable blades including 3 chopping blades: small dice blade, large dice blade, stick cut blade; and 4 mandolin blades: fine grater blade, course grater blade, julienne cut blade, and a slicing blade. 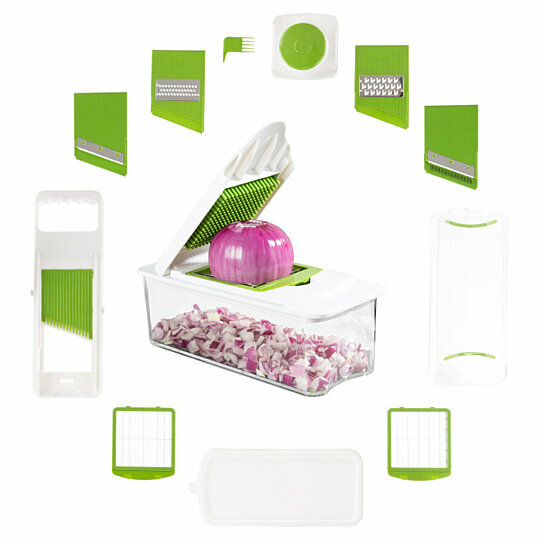 EASY STORAGE AND CLEANING- The set also comes with a 6 Cup storage base, lid, and cleaning tool; the storage lid is perfect for keeping prepped foods fresh in the base container, while the cleaning tool makes it easy to clean out the blades. SAFE AND STURDY CONSTRUCTION- BPA, PVC, and Phthalate free, this well constructed kitchen accessory also has a nonslip foot, so it sits securely on the countertop for added safety. It also has a safety food holder to protect your hands from the blades. CONVENIENT VERSATILITY- Ideal for busy cooks who want to do quick meal prep, this handy accessory is great for onions, tomatoes, potatoes, carrots, celery, apples, and more. Perfect for people on Paleo, gluten-free, vegetarian or Vegan diets! PRODUCT DETAILS- Material: Metal and Plastic free of BPA, PVC, and Phthalates. Dimensions: (L)13.25" (W)4.5" (H)4 " storage base has 6-Cup, 1.5L capacity. Includes 7 blade attachments, lid, storage base, cleaning tool, and safety food holder.